The Stars and Stripes as adopted by Act of Congress April 18, 1818. Purchased by the Society in 1909. A blue ground with the crosses of St. George, St. Andrew and St. Patrick. In use since 1801. Presented to the Society in 1933 by the Honorable Frederick Watson, C.M.G., O.B.E., British Counsul General at Philadelphia. A red maple leaf on a white field, flanked by two vertical red panels. It replaced the Canadian Red Ensign. Following the adoption of Resolutions recommending the new flag in the Canadian Houses of Parliament, on February 15, 1965, Queen Elizabeth proclaimed this to be the National Flag of Canada. Presented to the Society on November 30, 1977 by Howard C. Campbell, Esq., Canadian Counsul and Senor Trade Commissioner in Philadelphia. Seven red stripes and six white, with the joined crosses of St. George and St. Andrew in the canton. In the early years of the Revolutionary War, Americans fought under various flags. John Paul Jones first raised this flag on December 3, 1775, as the Navy Ensign of the thirteen colonies, when commander Esek Hopkins assumed command of our Navy newly created by Congress. General George Washington also hoisted this flag over his headquarters at Cambridge, Massachusetts on January 2, 1776 as the standard of the Continental Army. It was the first American Flag to be officially recognized by another country. It remained our national flag until the adoption of the Stars and Stripes on June 14, 1777. Purchased by the Society in 1940. 5. The British Red Ensign or Naval Red Ensign of Queen Anne. Prior to 1800. A red field with the Union Jack of Great Britain, the St. George’s and St. Andrew’s crosses in the canton. Adopted 1707. This was the flag of the colonies at the time of the founding of the St. Andrew’s Society of Philadelphia in 1747. Purchased by the Society in 1940. A blue ground with white St. Andrew’s cross. (Described as “Azure a Saltire Argent.”). This device is the base of the present Union Jack of Great Britain. Purchased by the Society in 1939. A gold (yellow) field, red lion rampant with border (which is the second quarter of the British Royal Standard). It first appeared on the seal of King Alexander in about 1230 A.D. Without modification it was borne by all the sovereigns of Scotland, and when James VI became King of England in 1603, it became an integral party of the Royal Standard and so remains to this day. Purchased by the Society in 1909. From 1892 Canadian merchant ships flew the British “red duster” modified by a shield with the coats of arms of the four original provinces. On November 26, 1921 the device was simplified by Royal Proclamation to embrace the arms of Canada equidistant between the outer point of the Union Jack in the canton and the fly of the flag. In 1924 as the Canadian Red Ensign, it became the national flag of Canada. It was taken into battle in the Second World War and in Korea, and carried by Canadian teams in the Olympic Games. It still flies in the hearts of many traditionalists. Presented to the Society in 1947 by Arthur Laurie Dewar, President of the Society 1952-1953. 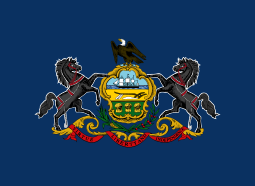 A blue round with the arms of the Commonwealth painted in the center. Adopted by the Commonwealth June 13, 1907. Purchased by the Society in 1912. Light blue and gold in three equal sections right to left with arms of the City painted in the center section. Adopted by the City Council March 27, 1895. Presented to the Society in 1913 by Caleb J. Milne, Jr., President of the Society 1915-1916. The Standard displays one of the earliest examples of thirteen stripes in its design. The original standard, presented in 1775, is on display at the First City Troop’s Armory. Other Troop records contain letters of thanks and releases from General High Mercer, mortally wounded at the Battle of Princeton, whose personal sword leads the procession at the annual dinner. Facsimile of the Regimental or Second Color of the Black Watch, as presented by George V when he became Colonel-in-Chief of the Regiment. The present Colonel-in-Chief is H.M. Elizabeth, the Queen Mother. The Royal Cypher within a garter, the badge and motto of the Order of the Thistle; in the Imperial Crown; the Sphinx superscribed “Egypt,” granted for service in Egypt in 1801. Presented to the Society in 1918 by David Mline II, President of the Society 1898-1899. Of red silk with a white center on which is embroidered the motto “Tandem Triumphans.” The banner raised by Prince Charles Edward Stuart at Glenfinnan on August 19, 1745. At Culloden Moor near Inverness of April 16, 1746, the Jacobite standard was captured and later publicly burned at Edinburgh along with thirteen colors of the clan regiments. The design of this flag was researched for the National Trust of Scotland by its maker, Patricia Newtown Labistour of Robin Hood’s Bay, North Yorkshire, England. This is only the second facsimile of the original standard; the first representation is on display in the National Trust museum of Glenfinnan. Presented to the Society November 30, 1966 by Stewarts, Stuarts’ descendants, and numerous other interested members of the Society. Since there is no such thing as a clan flag, this could best be described as a banner or standard. A field of gold (yellow) with the crest of the chief property encircled by a strap and buckle bearing the motto of the clan thereon; AONIABH RI CHEILLE (Unite). The details for this banner were obtained from Cameron of Lochiel, the then chief of the Camerons of Lochiel. Presented by Mrs. Cameron in 1924 in memory of her husband, Dr. John Lawson Cameron, who was elected a physician of the Society in 1915 and died in 1922. A field of white with the partial arms of the chief. “Argent, and oak tree in bend sinister, proper and surmounted of a sword, in bend of the last, supporting on its point, in dexter canton, an antique crown gules.” Motto: “E’IN DO BAIT” (spare not). This banner is similar to the one raised at the Kirkton of Balquhidder as a rallying point for the clan on August 30. 1745. Presented to the Society in 1940 by seven members: C. Kennedy Allen Jr., Walton Gibb, John MacAdam, Norman K. MacGregor, Richard G. Sutcliffe, Hilson H. Whyte and Laurence S. Whyte. The present design has been adopted from the scanty remains of the original White Banner of MacKay, known in gaelic as the Bratach Ban. It represents a blue lion rampant, in a shield, surrounded by gold fleurs de lis. Above the shield a golden sinister skeletal hand clasps the motto of the “VERK VISLY AND TENT TO YE END,” being loosely translated as “work wisely and look to the outcome.” The new representation of the banner is constructed in blue velvet and gold kid, on a background of off-white jersey silk. The details are in pure gold purl wire and blue and gold heraldic cords. A specially handwoven fringe in blue and gold silk frames the design. The banner is the work of Patricia Newton Labistour. Donated to the Society on November 30, 1971 by Donald Alan Mackie, a member of the Society 1959-1981, in memory of his father, William A. Mackie, a member of the Society 1943-1949. The crest is a heraldic representation of the stronghold of the early Morrisons, perched on its green island and lapped by the silvery waves of the northern seas. The hand wielding the dagger seems a warning to marauders that they will be effectively repelled. The buckler bears the words of the clan and originated on the Island of Lewis in the Outer Hebrides. The first to land there were washed ashore on a piece of driftwood from Norway. In memory of that uncharted voyage, their descendants wear a piece of driftwood as their badge. The stronghold of the early Morrisons in Lewis was an island off the rocky coast, called “Dun Eistein” (Hugh’s Castle), which is now the slogan of the clan. This banner, made by Patricia Newton Labistour, is the gift of Cortlandt Van Dyke Hubbard, a Morrison descendent and chairman (1965-1980) of the Society’s Standard Bearers Committee, and was presented to the Society November 30, 1970. A royal blue field with the insignia of the Society in full color with the name and date of the founding in red. The first was purchased by the Society in 1909. NOTE: Flags acquired 1937 were destroyed in a fire that year and since replaced.